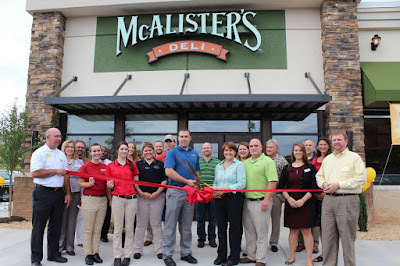 Blueridge Beauty Blogger: McAlister's Grand Opening in Lynchburg! Disclaimer: I have not been compensated nor endorsed by this restaurant nor its parent company for this review. All opinions are mine in a constructive and non-abusive manner! My mother and I had a lunch date at the Grand Opening of McAlister's Deli located off Wards Rd near Kohl's! After the Chamber of Commerce ribbon cutting, we were the first customer to enter this reaturant!! McAlister's Deli takes great pride in quality deli sandwiches, appetizers, and signature Sweet Tea! Today, folks in Lynchburg get try out their signature food and hospitality! 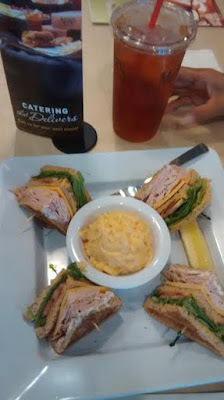 Since I was following their Facebook page, I suggested and ordered the McAlister's Club which consist of "Butterball smoked turkey, Black Forest ham, sharp cheddar, Swiss, lettuce, tomatoes, McAlister's Honey Mustard and lite mayo on sliced wheat bread." For the side, I wanted to try their version of mac and cheese and two McAlister's Famous Sweet Tea (sweetened with lite ice for me and unsweetened with lemon for Mom). We decided to split the sandwich and pasta since it was generous portion (McAlister's Deli prides themselves for generous portions and free tea refills) at their comfortable booth! The interior of the dinning area reflects pictures of Greater Lynchburg area and Liberty University campus! I tried the mac and cheese and it tasted great with its mild cheddar cheese sauce and reminds me of homemade!! 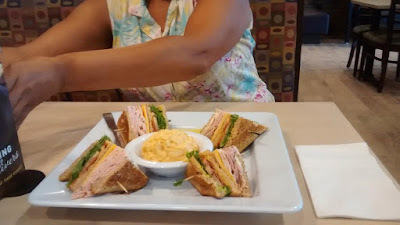 Next I tried the Club and meat/filling ratio was great, veggies were fresh, love the honey mustard, and whole wheat bread was toasted just right for a club sandwich! I finished my meal with the signature ice tea and it was great...I rank it No. 1 to McDonald's and Bojangles teas! The staff and management showed their famous McAlister's hospitality from ordering the sandwich, delivery of our meal at the booth, answering our questions,taking our plates, and hope we come back soon! Plus, a portion of the proceeds for this week's sales goes to the Daily Bread of Lynchburg as part of social responsibility in the community this restaurant serves! I highly recommend McAlister's Deli to anyone in Lynchburg for their great food and geniune hospitality! Sounds like a great place to hang around... The food looks tempting! It really is..great food and great hospitality!! Your meals look delicious. It seems like you had a great time. Thank you, Melissa! I am in contact with marketing and they will let me know when Family/Kids night will start soon on Monday and she mentioned several special needs/Autism families have participated in the fun and crafts! I plan to do another post with my son, Nathan, who is living with Autism!